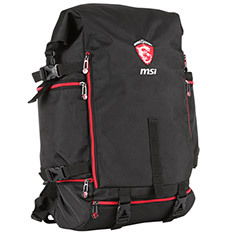 The MSI GT Gaming Battlepack features a light yet spacious design with plenty of compartments for accessories. It has a tear and water-resistant exterior to keep all your important belongings protected as well as lots of straps and buckles for customisable adjustments. Complete with MSI gaming styling, the GT Battlepack is an indispensable accessory for GT series notebooks.